Major General Lê Văn Cương, in a talk with the HCMC Legal Daily in 2012, said China is going without allies as a result of its vicious expansionism and readiness to do anything to attain its goals. The Vietnamese National Assembly in June 2012 passed the Law of the Sea. Just ask China if there is any littoral state on earth is going without law of the sea. 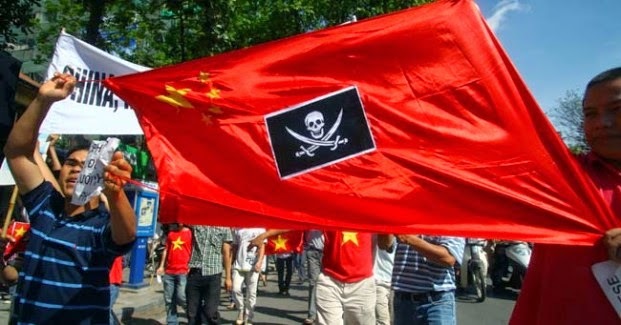 While the Chinese have not issued a law of the sea, they make do by seven other acts to dominate and to maintain their territory at sea, including Maritime Law, Basic Line Law, Ocean Law, etc. So Vietnam adopts the Law of the Sea is “exactly like when you own a house with a garden, and you have to fence the garden”, explained General Le Van Cuong. -Reporter: In the recent tension [in the South China Sea], Chinese media has been reporting a lot of misleading information on Vietnam. It seems China is trying to use its state-controlled media machine to incite the people, isn’t it? 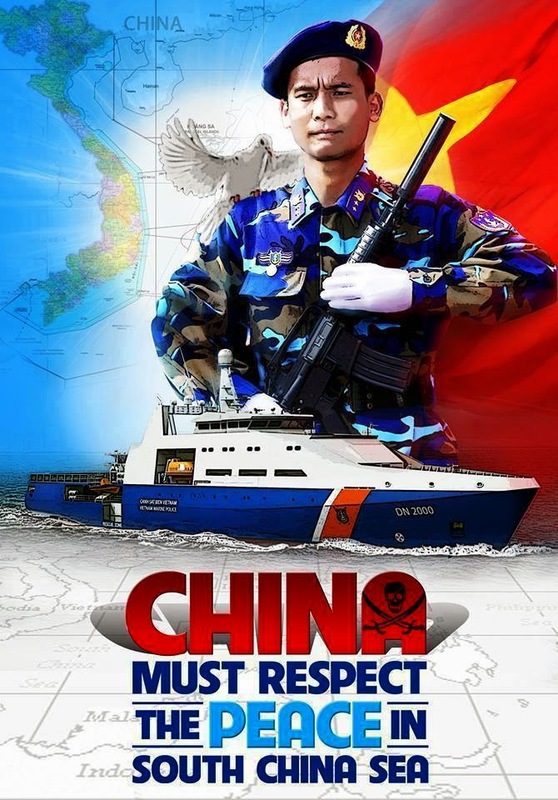 - Major General Le Van Cuong: Some Chinese journalists and scholars write on the Global Times, a newspaper under the People’s Daily, calling for a war against Vietnam, claiming it as the only way to solve the South China Sea issue, blaming Vietnam to be the only invader and the most aggressive country in the world. They portray Vietnam as a criminal and a deceiver who cheats their army and the whole world. - It has been a Chinese tradition to deceive since the Eastern Zhou dynasty. People are molded into sheep that simply obey with the superior. Chinese media has so far been the planet’s biggest system of lying that operates just at the wills of the political elite. In this aspect, China outdoes the United States. 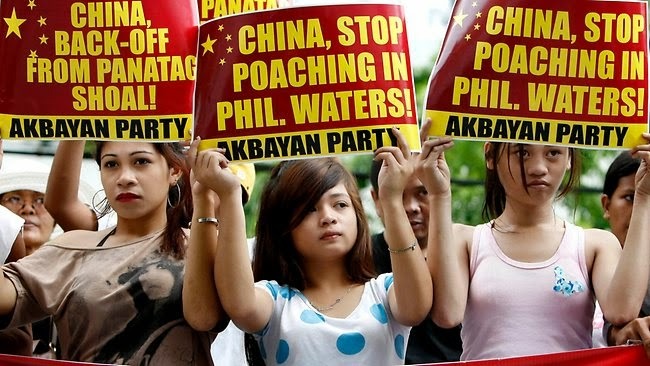 A protest rally against China in the Philippines. - Scientifically, every big nation to no small extent has some element of expansionism. Not just China, but also are the United States, Russia, Germany, Japan, and India. This is a universal characteristic [of big nations] just as wealthy people tend to look down on indigent ones. It is true to an individual, a community, and a nation also. Therefore peaceful evolution is not unique to the United States. Although peaceful evolution of modern time traces its root to the United States, China is truly the father and the world’s master of manipulating a nation to make sure its government acts at their will. 2600 years ago, in the Spring and Autumn period, Guan Zhong of the Qi state was the inventor of peaceful evolution as he used manoeuvres of sowing division, employing economic coercion, exaggerating conflicts, and hawking slanderous news so that the king would punish the loyal and leave only the fawns and the inefficient. The nation would thereby decline and he would dominate the five neighboring states within just several years. The United States is just an imitation of China in this aspect. - Chinese expansionism is characterized by two distinguished traits. First, it is more vigorous and vicious than other countries. - There has been a confluence of two streams, expansionism and short-term interests. The 1969 war against the Soviet Union was a sacrifice of China to prove to the United States that China was not an ally of the Soviet Union. In February 1979, by sacrificing Vietnam, once again Beijing proved to Washington that it was not in any alliance with Hanoi. Before attacking Vietnam, Deng Xiaoping even visited Washington, wearing a cowboy hat, telling US President Carter, “We are Eastern NATO.” Vietnam was the victim in China’s exchange with the United States. - I believe that Vietnam was sold down the river a total of five times. On March 1st 1972, Kissinger held a press conference in Tokyo, in which he gave a famous statement, “now we only look to Moscow to crush Hanoi.” Following the signing of the Shanghai Joint Communique, Nixon succeeded in doing shocking things that his previous presidents had failed to do, including blocking the Hai Phong port, the only sea lane connecting Vietnam to the world, commanding airstrikes very close to China-Vietnam boundary, then launching the twelve-day campaign of “Dien Bien Phu in the air”. Loss of human lives and property caused by US air raids in the north of Vietnam since March 1st 1972 until the conclusion of the Paris Peace Accord equal the total damages in the six previous years. In the south, blood was shed. So the Shanghai Joint Communique was actually written in the blood of the Vietnamese people. For the fourth time, China became the perpetrator behind the massacre of over two million Cambodians. China supported the Khmer Rouge with almost everything from food to arms, from ammunition to medicines. In the southwestern border war of 1976-1978, China used the Khmer Rouge to fight Vietnam. Subsequently when we liberated Cambodia, China hyped up to the world that Vietnam was plotting the establishment of “the Indo-China Federation.” It is ironical that the perpetrator of a massacre could calumniate those who saved the Cambodian people from a holocaust. “Historically, in all of its disputes with other nations, China has never been reasonable. In the 1962 war with India, it appropriated tens of thousands of land miles without any reason.